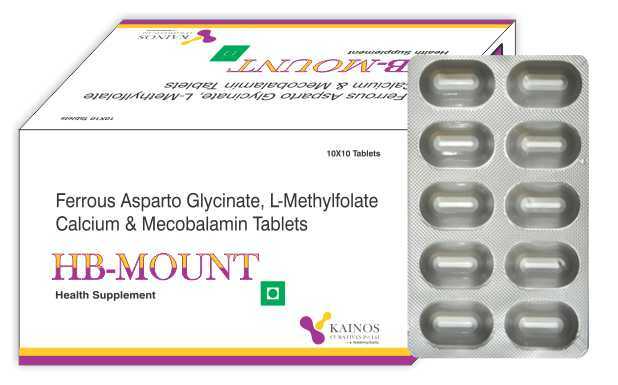 Ferrous Asparto Glycinate, L – Methylfolate with Mecobalamin Tablet is a synergistic combination of the nutritional substances which helps in anemia. This product is versatile, high – potency Iron with essential nutrients formula as the primary dietary supplement for all types consumers especially women and those who are not able to take a balanced diet with recommended serving of fruits and vegetables due to their hectic life style and untimely food habits and not eating enough foods. These nutrients are needed by the body for the formation of red blood cells. If the body does not receive adequate amounts of these nutrients, anaemia can develop. During pregnancy the daily requirement for these nutrients increases. This combination is used for iron deficiencies in human useful in anemia caused by low levels of iron or folate in the blood. It is also used in pregnancy for the prevention and treatment of low blood levels of iron and to supply folic acid to the body. Iron deficiency anemia is the most common type of anemia and is also known as sideropenic anemia. Iron deficiency anemia occurs when the dietary intake or absorption of iron is insufficient and hemoglobin, which contains iron, cannot be formed. These supplements include any consumed products that aim to supplement the diet and provide additional nutrients that may be missing from it or are not being consumed in sufficient quantities. So this combination increase overall level of health, and may even slow down the process of growing old. Ferrous Asparato Glycinate is a novel compound complex of aspartic acid & glycine with iron. All dietary iron has to be reduced to the ferrous form to enter the mucosal cells; therefore ferrous iron is absorbed three times more readily than the ferric form. Moreover, ferrous asparto glycinate is also a chelated iron. It is better tolerated and absorbed compared to other forms of iron, allowing for lower iron dosing. It restores iron levels for people who are iron deficient. Iron is a mineral that's necessary for life. Iron plays a key role in the making of red blood cells, which carry oxygen. We can get iron from food and from supplements. If we don't have enough iron, we may develop anemia, a low level of red blood cells. Folate is a form of B vitamin that occurs naturally in many foods. Folic acid is the man-made form of folate that is added to processed foods or vitamin and mineral supplements. Folate is needed in the human body for production of red blood cells. A lack (deficiency) of folate in the human body can be caused by certain diseases, by taking certain medications, or by not getting enough folate in your diet. Folate deficiency can lead to decreased red blood cells, or anemia. Folate deficiency can also cause high levels of a certain amino acid in the blood, a condition called hyperhomocysteinemia L-methylfolate. The product is POSSIBLY SAFE for most adults when taken by mouth. There is no disadvantage associated with the product if taken under the recommended usage. Pregnant and lactating mothers should not take any single supplement in higher-than-normal doses unless recommended by a health-care provider for a special condition. The combination should only be used in pregnancy and lactation if benefits outweigh the risks.